A translation of Pravda o Kronshtadte, produced by SRs shortly after the event in 1921. This version is taken from: http://www-personal.umich.edu/~mhuey/HOME.html Copyright © 1992, 1998 by Scott Zenkatsu Parker. The author permits the unlimited duplication, transmission, and distribution of this text with the proper citations for academic, educational, and non-commercial use only. It must always be remembered - and remembered well - that revolution does not mean destruction only. It means destruction plus construction, with the greatest emphasis on the plus. Alexander Berkman, The Russian Tragedy (Berlin: Der Syndikalist, 1922), p. 16. Kronstadt is of great historic significance. It sounded the death knell of Bolshevism with its Party dictatorship, mad centralisation, Tcheka terrorism and bureaucratic castes. It struck into the very heart of Communist autocracy. At the same time it shocked the intelligent and honest minds of Europe and America into a critical examination of Bolshevik theories and practices. It exploded the Bolshevik myth of the Communist State being the "Workers' and Peasants' Government". 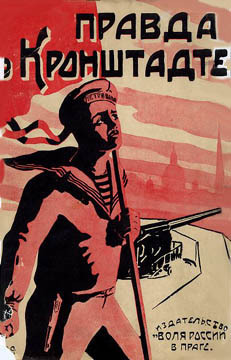 Berkman, The Kronstadt Rebellion (Berlin: Der Syndikalist, 1922), pp. 41-42. Nor is it only the liberty and lives of individual citizens which are sacrificed to this god of clay, nor even merely the well-being of the country - it is socialist ideals and the fate of the Revolution which are being destroyed. Berkman, The Russian Revolution and the Communist Party (Berlin: Der Syndikalist, 1922), p. 36.